Major mistakes in Rail Baltica CBA made by Ernst & Young. There are several fundamental mistakes in the Rail Baltica (RB) cost-benefit analysis prepared by Ernst & Young Baltic (EY). Our study does not assess the truthfulness of the freight and passenger volumes forecasts; instead, the main object of our study is the assumptions used in the CBA and the calculations of the socio-economic impact of RB. ● EY has stated that the biggest benefit of RB will arise from liquidation of air pollution. 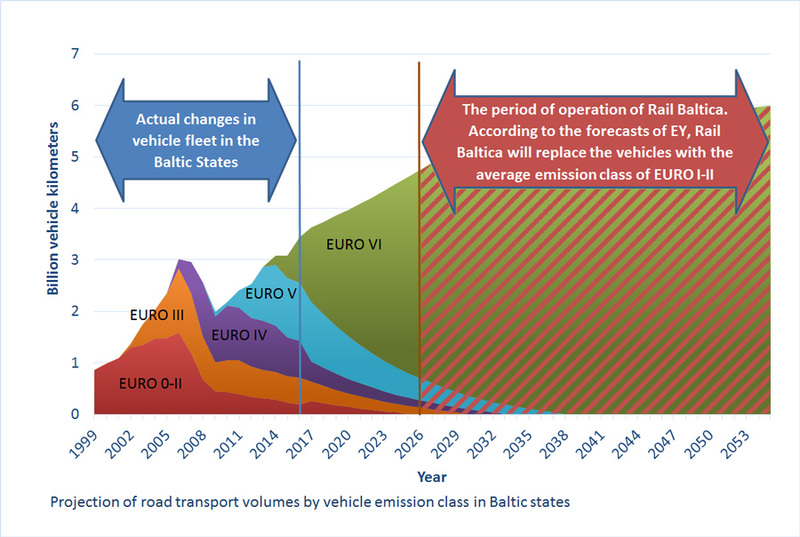 In reality, the trucks do not generate the claimed volumes of air pollution in the Baltic States. Manipulation of emission standards and fuel consumption of trucks has artificially increased the socio-economic benefits of RB. ● The EY report does not cover the external costs of the environmental impacts arising during the period of railway construction, and also not the ongoing environmental burden of the railway during its operation which is a requirement of the CBA guide. ● Most of the road transport takes place without using any freight terminals; it is apparent from the response of RB Rail and EY that the replacement of such road transport with RB would not be feasible due to the costs of the last-mile delivery. ● EY has assumed that RB will compete with a small part of road transport where terminal handling is included but has not taken into account the additional transportation costs from the railway freight terminal to the main trucking terminal. ● The CBA Guide requires that “a complete set of data and sources of evidence (used in the CBA) should be made easily available”; however, none of the calculations and only a few of the sources referred to in the study have been made available despite frequent requests. Even when considering only the mistakes from such assumptions that can be easily calculated, the total income of RB of €16 billion will be reduced by over €4 billion. It appears that the costs of RB will exceed the socio-economic benefits and therefore it will not be expedient but instead detrimental for the society. In addition, RB will not be eligible for EU co-financing, because the project is not viable.